With The Power of Winning, you’ll hear firsthand what drives high-performing competitors. These engaging stories and strategies for success are provided by today’s top experts on winning, from New York Times bestselling authors and sports luminaries to other successful people who have bucked the odds to achieve greatness. You’ll also develop the core skills of a winner, including mastery of the winner’s mind-set. There are a few keys to winning, and learning them doesn’t have to be difficult. You just need the right tools. From overcoming adversity to finding motivation when the odds are against you, The Power of Winning audio suite offers hours of inspiration and practical steps toward reaching your personal best, whether you’re in the boardroom or in the field. Featuring top international speakers, The Power of Winning will be your master class for reaching your highest potential. 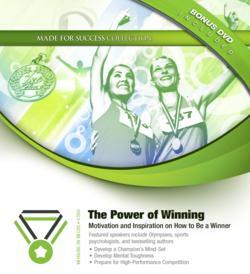 Enjoy The Power of Winning today to refine and master your skills in competition, strategy, and the art of winning.